FOXC1 loss contributes to Dandy-Walker malformation (DWM), a common human cerebellar malformation. Previously, we found that complete Foxc1 loss leads to aberrations in proliferation, neuronal differentiation and migration in the embryonic mouse cerebellum (Haldipur et al., 2014). We now demonstrate that hypomorphic Foxc1 mutant mice have granule and Purkinje cell abnormalities causing subsequent disruptions in postnatal cerebellar foliation and lamination. Particularly striking is the presence of a partially formed posterior lobule which echoes the posterior vermis DW 'tail sign' observed in human imaging studies. Lineage tracing experiments in Foxc1 mutant mouse cerebella indicate that aberrant migration of granule cell progenitors destined to form the posterior-most lobule causes this unique phenotype. Analyses of rare human del chr 6p25 fetal cerebella demonstrate extensive phenotypic overlap with our Foxc1 mutant mouse models, validating our DWM models and demonstrating that many key mechanisms controlling cerebellar development are likely conserved between mouse and human. The developmental pathology of Dandy-Walker Malformation (DWM), a common human cerebellar birth defect has not been completely delineated and only a few genetic causes have been identified (Aldinger et al., 2009; Blank et al., 2011; Doherty et al., 2013; Aldinger and Doherty, 2016). We previously reported that rare heterozygous deletions (del) of the forkhead box C1 (FOXC1) gene on human chromosome (chr) 6p25 are associated with DWM (2). We have also conducted an extensive phenotypic analysis of the Foxc1 homozygous null (Foxc1-/-) mice where we have shown that both zones of neurogenesis, the ventricular zone and rhombic lip, are disrupted in Foxc1-/- mice (Aldinger et al., 2009; Haldipur et al., 2014). This analysis provided some key insights regarding the developmental disruptions underlying this important brain malformation, yet many questions remain. Here, we present a developmental analysis of the foliation defects in Foxc1 hypomorphic mutant (Foxc1hith/hith) mice. These mice are viable as adults and display a unique posterior foliation defect that is strikingly similar to the DWM ‘tail sign’ which has been recently proposed to represent a pathognomonic feature of DWM (Bernardo et al., 2015). We present mouse genetic lineage mapping data that identifies premature and abnormal migration of posterior vermis-fated rhombic lip (RL) derived cells as the cause for this striking phenotype. We also present the analyses of 3 rare human fetal del chr 6p25 DWM cases which show extensive phenotypic overlap with Foxc1 mutant mouse cerebellar defects, including ectopic granule cell progenitors (GCPs) and Purkinje cells, dysmorphic Bergmann glial fibers, and posterior vermis disorganization. Since Foxc1 mutations in mice recapitulate multiple aspects of the developing and mature human del chr 6p25 DWM cerebellar pathology, these data validate Foxc1 mutant mice as models for human DWM. Further, our analyses clearly demonstrate that competent meningeal signaling is required for multiple aspects of prenatal and postnatal cerebellar development. One hallmark of human DWM is posterior vermis hypoplasia. As illustrated in Figure 1A–B, the normal human cerebellar vermis has a trilobar appearance, with primary and secondary fissures readily distinguishable (Figure 1B, white arrowheads). The posterior vermis lobules, below the secondary fissure, are well formed and a distinct choroid plexus is evident (Figure 1B, yellow arrowhead). In contrast, the cerebellar vermis in our del chr 6p25 DWM patient cohort (Aldinger et al., 2009) ranges from very hypoplastic and dysplastic (Figure 1C,D), to less severely affected (Figure 1E,F). Regardless of the extent of dysplasia, these individuals with del chr 6p25 share a common extended and dysplastic posterior vermis with an indistinct choroid plexus. This feature has recently been designated the DWM ‘tail sign’ and may be pathognomonic for DWM (Figure 1D,F, red arrowhead) (Bernardo et al., 2015). Similarities of human DWM and mouse Foxc1hith/hith posterior folial abnormalities. (A–F) T1-weighted midsagittal magnetic resonance images in the postnatal control subject (A,B) and two subjects with del chr 6p25.3 CNVs that include FOXC1 or intragenic mutations of FOXC1 diagnosed with Dandy Walker Malformation (Aldinger et al., 2009) (C–F). The midline cerebellar vermis (v) and choroid plexus (CP) are marked only in the controls. Asterisks (*) indicate an enlarged posterior fossa in DW cases. The white arrowheads mark the 10 and 20 fissures, while the red arrowhead indicates upward rotation of the cerebellar vermis and abnormal posterior DW tail. Sagittal sections of P21 cerebellar vermis from wild-type (G,H, K, M, O) and Foxc1hith/hith (I,J, L, N, P) mice. The Foxc1hith/hith cerebellum is characterized by the presence of a partially formed posterior lobule X (I,L box; J). The stereotypical wild-type cerebellum foliation pattern is disrupted in Foxc1hith/hith mutants. Primary and secondary fissures are noted (black arrowheads). Four cardinal fissures (black asterisks) divide wild-type postnatal cerebellar vermis into five cardinal lobes. Foxc1hith/hith mice exhibit an excess of granule cell progenitors (GCPs) in the e17.5 RL (P, red arrowhead). Scale bars = 100 µm (H, J, K–P) and 500 µm (G,I). Foxc1-/- mice have substantial cerebellar abnormalities as neonates (Aldinger et al., 2009; Haldipur et al., 2014). During embryogenesis, Foxc1-/- mice have dramatic VZ proliferative deficits and GABAergic neuronal migration defects in addition to RL abnormalities (Aldinger et al., 2009; Haldipur et al., 2014). Neonatal lethality precludes evaluation of cerebellar foliation, which is a postnatal process in mice. Furthermore, mouse Foxc1-/-phenotypes are more severe than those seen in del chr 6p25 patients who retain one functional FOXC1 allele. We previously reported that mice homozygous for a Foxc1hith/hithhypomorphic allele are viable as adults and have abnormal cerebellar foliation (Aldinger et al., 2009). These mice retain 5% Foxc1 activity (Zarbalis et al., 2007). Here, we add to our previous report, showing that Foxc1hith/hithmice have a highly unusual, partially formed posterior lobule (lobule X), which aberrantly exposes the internal granule layer to the fourth ventricle. This phenotype is reminiscent of the human DWM tail (Figure 1I,J). To our knowledge, Foxc1hith/hith mice are the only mouse model to consistently show this foliation phenotype. Thus, an analysis of the developmental events resulting in this highly specific and disease-relevant foliation defect are likely to inform the developmental pathology of the posterior vermis defects in human del chr 6p25 DWM. Cerebellar foliation normally follows a stereotypic pattern and sequence. Four cardinal vermis fissures, including the primary and secondary fissures, are anchored late in embryonic mouse development, then additional fissure formation and folia lengthening progress postnatally (Sudarov and Joyner, 2007; Legué et al., 2015). Although the primary and secondary fissures were readily evident at P15 (Postnatal day 15) in both wild-type and Foxc1hith/hith mice, a delay in posterior fissure formation was evident at P1 in Foxc1hith/hith mice, (Figure 1M,N; asterisks) and the Foxc1hith/hith posterior vermis was clearly disorganized at this stage (Figure 1N). At e17.5, the Foxc1hith/hith RL was very disorganized with an abnormal abundance of apparent GCP (Figure 1P) (Ki67+/Pax6+ data not shown), similar to the RL phenotype we previously reported in embryonic Foxc1-/- mice (Aldinger et al., 2009; Haldipur et al., 2014). To further dissect the mouse Foxc1hith/hith RL and posterior vermis phenotype, we employed a RL genetic fate mapping system. Specifically, we generated wild-type, Foxc1-/-, and Foxc1hith/hith mice carrying both an Lmx1a-cre transgene and Ai14, a tdTomato-cre reporter construct (Chizhikov et al., 2010; Madisen et al., 2010). In e17.5 WT animals (Figure 2A), Lmx1a-cre is expressed in the subset of embryonic cerebellar RL cells fated to give rise to the fourth ventricle choroid plexus epithelium, GCPs, and their descendants which are restricted to the posterior vermis (lobule X and the posterior half of lobule IX), and unipolar brush cells within the core of the developing cerebellum (Chizhikov et al., 2010). As expected, by P0, the RL had fully regressed in wild-type animals and the RL-derived Lmx1a-labeled lineages were clearly limited to lobule X and the posterior half of lobule IX (Figure 2C). Null and Hypomorphic Foxc1 mutations caused posterior cerebellar foliation defects due to mismigration of cells destined to form the posterior vermis. (A–J) Lineage analysis of the Lmx1a-cre+ cells in the wild-type mice showed tdTomato expression limited to the RL, EGL and presumptive IGL. Postnatally, fate-mapped cells populated the posterior vermis but did not abut the 2o fissure (C, white arrows). In the wild-type embryonic cerebellum, these cells were present underneath the EGL directly underneath the pial surface (A, E, G, I; white arrow). In Foxc1hith/hith Lmx1a-cre tdTomato mice, cells migrated out of the RL in multiple ectopic streams (B, yellow arrows). Postnatally, in the Foxc1hith/hith mutant cerebellum, ectopic tdTomato+ cells were present along the ventricular surface and the inner cerebellar core (D, yellow arrows). In Foxc1-/- mice (F,H,J), aberrantly migrating Lmx1a-cre tdTomato+ cells were evident by e14.5 in the core (F) and found in the VZ by e15.5 (H, yellow arrow), with an extensive VZ surface presence by e17.5 (J; yellow arrow). Additionally, at e17.5, a large number of fate-mapped mutant cells were abnormally retained in an enlarged RL (J). None of the mutant internal tdTomato+ cells were Sox9+ (K,k), Skor2+ (L,l) or Pax2+ (M,m), and thus had not undergone a VZ lineage fate-switch. A subset of the fate-mapped cells were Tbr2+ (N,n, arrows), as expected of RL-derived unipolar brush cells. All tdTomato+ cells were Pax6+ (O–P). This indicated that they retained their RL origin despite aberrant migration. A subset of the Pax6+ cells is Ki67+ (O, o, Q; yellow arrows) indicating that they retain their ability to divide, while some tdTomato+ cells in the RL (asterisk) are β-III Tubulin+ (R) and Ki67- indicating that they may have differentiated precociously. Scale Bar = 100 µm (A–D, K–Q), 50 µm (E–J). We next determined that Lmx1a expression was not dependent on Foxc1 expression. At the onset of Lmx1a RL expression at e13.5, there was no difference in Lmx1a expression between WT and Foxc1-/-(Figure 2—figure supplement 1A). By e17.5, however, in Foxc1hith/hith mice, Lmx1a-cre marked cells remained restricted to the posterior vermis yet the RL retained an excess of labeled cells (Figure 2B). Many streams of Lmx1a-lineage marked cells were also aberrantly located within the core of the developing cerebellum in addition to cells normally traversing into the External Granule Layer (EGL) (Figure 2B, arrows). By P0, labelled EGL cells had ectopically migrated anteriorly to the secondary fissure, the anterior boundary of lobule IX in the Foxc1hith/hith mutants (Figure 2D). We also observed large numbers of Lmx1a-fate mapped cells along a residual posterior ventricular zone in Foxc1hith/hith mutants (Figure 2D, yellow arrow). To determine if similar migration deficits contributed to the severe RL and early EGL phenotypes we previously reported in Foxc1-/- mutant embryos, we also conducted Lmx1a-cre fate mapping on Foxc1-/- mice (Figure 2E–J). As expected, in wild-type embryos, most Lmx1a-cre labelled cells exited the RL and migrated into the posterior EGL between e14.5 and e17.5 (Figure 2E,G,I). In Foxc1-/-mutants, however, dramatic mismigration of the posterior-fated RL lineage was evident as early as e14.5 (Figure 2F). By e17.5, an abnormally large RL showed numerous retained Lmx1a-cre+ cells. Ectopic Lmx1a-cre+ streams of cells were also present along the VZ (Figure 2H,J). Quantification of tdTomato+ cells present outside of the EGL and RL area in the wild-type and Foxc1-/-mutants indicates significantly higher numbers of ectopic tdTomato+ cells in the mutant (Figure 2—figure supplement 1B). Thus, RL and VZ development in Foxc1-/- mutants is more severely disrupted than in Foxc1hith/hith (Figure 2—figure supplement 1C) (Haldipur et al., 2014). We tested if Lmx1a-fate mapped cells found in the e17.5 Foxc1-/-cerebellar anlage core were incorrectly derived from re-specified VZ fates. We did not however detect any Lmx1a-lineage marked (tdTomato+) VZ progenitors (Sox9+), GABAergic interneurons (Pax2+) or Purkinje cells (Skor2+) (Figure 2K–M). Rather, all tdTomato+ cells retained a Pax6+ RL lineage identity (Figure 2O–P, arrows). As expected, a subset of the internally-located tdTomato+ Lmx1a-fate mapped cells was Tbr2+ positive (Figure 2N,n, arrows), consistent with the unipolar brush cell fate expected from the RL Lmx1a+ lineage. However, we note that while a large subset of the misrouted GCPs continues to proliferate (Figure 2Q, red and yellow arrow; Figure 2—figure supplement 2C,D, arrows), we also observe that many of the Lmx1a-cre tdTomato+ cells that fail to migrate out of the RL eventually differentiate precociously within the RL (Figure 2R). We conclude that a combination of mismigration and precocious differentiation causes a depletion of granule cell progenitors required to form the posterior vermis, thus leading to severely hypoplastic posterior lobules in Foxc1hith/hith mice. The late Foxc1-/- embryonic (e19.5) cerebellum had additional abnormal granule lineage migratory phenotypes not readily seen in Foxc1hith/hith mice (Figure 2—figure supplement 2A–H). In wild-type animals, proliferating GCPs were restricted to the outer EGL (Figure 2—figure supplement 2A, inset). However, in Foxc1-/- embryos, we consistently observed streams of proliferating GCPs from the EGL ectopically migrating into the cerebellar core. Some of these streams disrupted the nascent Purkinje cell plate under the EGL, further contributing to the profound disorganization of the Foxc1-/- mutant cerebellum (Figure 2—figure supplement 2B–D, arrows). Since GCPs secrete reelin as a chemoattractant to Purkinje cells radially migrating outward from their VZ origin, it was not surprising to observe ectopic Purkinje cells within the core of the developing cerebellum together with ectopic granule cells in Foxc1-/- mutants (Figure 2—figure supplement 2F,H, boxes). We also expect that at least some of these centrally-located ectopic Purkinje cells were the result of aborted outward radial migration of Purkinje cells out of the VZ due to the disruption of the radial scaffold in Foxc1-/- mutants, a phenotype that we previously reported (Haldipur et al., 2014). We observed less severe Purkinje cell alignment defects in postnatal Foxc1hith/hith cerebella. In wild-type animals, the maturing Purkinje cells organize into a monolayer evident around P16 (Figure 2—figure supplement 2I), while in Foxc1hith/hith mice, we observed multilayered Purkinje cells in addition to ectopic Purkinje cells fully embedded within the internal granule cell layer (IGL) in multiple lobules (Figure 2—figure supplement 2J–L, arrows, box). Both foliation and lamination abnormalities observed in postnatal Foxc1hith/hith mouse mutants are reminiscent of defects observed following meningeal cell destruction by chemical treatment with 6-OHDA in neonatal hamsters (von Knebel Doeberitz et al., 1986), which caused disorganized radially oriented glial fibers due to loss of contact with absent meninges. However, in postnatal Foxc1hith/hith cerebella, GFAP immunostaining for Bergmann glial fibers showed normal radial fiber organization (Figure 2—figure supplement 2N). Laminin immunostaining, which highlights the pial basement membrane, was neither different from wild-type nor discontinuous in early postnatal Foxc1hith/hith cerebella (Figure 2—figure supplement 2P). Thus, our results do not support a mechanism similar to that of postnatal meningeal ablation for folial and laminar alterations in Foxc1hith/hith cerebella. Rather, the Foxc1hith/hith phenotype is consistent with a loss of Foxc1-dependent SDF1α signaling (Figure 2—figure supplement 1D), which we have previously shown to be responsible for a number of embryonic phenotypes, in particular, the loss of radial glial structure and aberrations in cell migration of both the VZ and RL in Foxc1-/- mice (Haldipur et al., 2014). 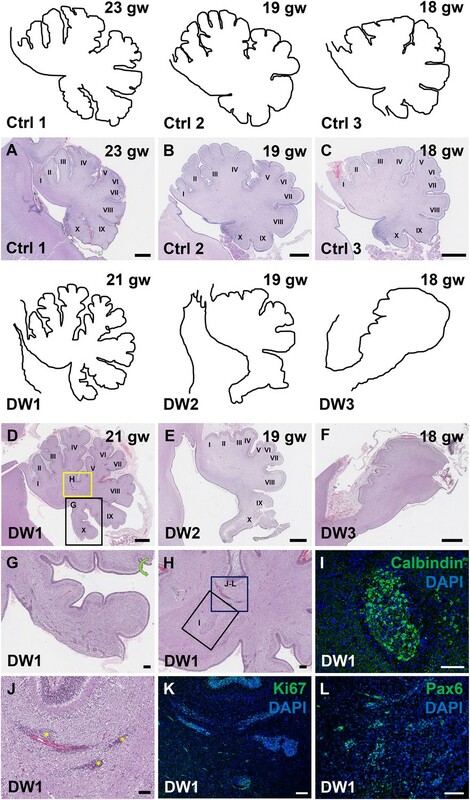 Although our analysis of cerebellar development in Foxc1-/- and Foxc1hith/hith mouse mutants has revealed multiple aberrant developmental programs, the relevance of these deficits to human del chr 6p25 DWM is largely inferred. Human brain imaging studies have limited resolution and ideally require autopsy confirmation postmortem. However, few postnatal or fetal human DWM pathology studies are published. Importantly, a recent study by Delahaye et al. (2012) identified three human fetal del chr 6p25 DWM cases with large deletions (6.6–17 Mb) encompassing the FOXC1 gene. The availability of these rare human fetal samples provided us with the unique opportunity to directly compare cerebellar vermis developmental pathology across species with similar genetic lesions in order to validate our Foxc1 mutant mouse DWM models. To study the gross anatomy of the human fetal cerebella, we compared sagittal sections of cerebellar vermis from all three del chr 6p25 fetal cases with age-matched control cases (Figure 3—source data 1) (Delahaye et al., 2012). No posterior fossa anomalies were detected either by prenatal ultrasound or autopsy in these control cases. Low magnification images of the H and E stained cerebellar vermis from the control cases indicated normal development of the folia. All histogenic layers of the developing cerebellum appeared normal. The EGL was of uniform thickness across the cerebella and the Purkinje cells formed a continuous multilayer Purkinje cell plate under the EGL from the anterior to posterior lobes (Figure 3A–C). In all del chr 6p25 cases, striking foliation defects of varying severity were observed (Figure 3D–F). In the cerebellum with the least severe DWM phenotype, DW1, the posterior-most lobule, lobule X, was only partially formed (Figure 3D,G). However, the anterior lobules appeared relatively normal. The defects in cerebellar foliation were far more severe in the other two del chr 6p25 cases, DW2 and DW3. In both cases, the vermis was hypoplastic with the most severe hypoplasia and dysplasia readily evident in the posterior vermis, despite obvious artefactual tissue damage. Yet, even the lobules in the anterior vermis were not readily distinguishable, with rudimentary fissures defining several lobules of variably indistinct identity. (Figure 3E,F). Although the posterior-most vermis was missing in DW3, the remaining posterior surface of DW3 was remarkably flat with no recognizable fissures (Figure 3F). Defects in cerebellar foliation and histogenesis were observed in human DWM cases with deletions in chromosome 6p25. (A–I) Hematoxylin and Eosin stained midsagittal sections through the fetal cerebellar vermis in normal (A–C) and del chr 6p25 samples (D–F). Ages are indicated in gestational weeks (gw). Cerebellar outlines are provided for clarity with higher magnification locations indicated. The Xth lobule of the posterior vermis in DW1 (D, black box; G) was only partially formed, similar to the Foxc1hith/hith cerebellum while in (E–F), the posterior vermis was severely dysplastic in DW2 and DW3. The del chr 6p25 cerebella also had ectopic Calbindin+ Purkinje cells (H, box and I) and ectopic Ki67+ Pax6+ GCPs (H, box J–L). Scale bar = 1 mm (A–F), 200 µm (G) and 100 µm (H–L). Unique to all of the DW cases, heterotopic cell clusters were evident with H and E staining. These were particularly prominent in DW1 (Figure 3D,G–I). For example, at the base of the fissure between lobules IV and V, an ectopic calbindin+ Purkinje cell cluster was evident. Just above this, numerous proliferating Ki67+ Pax6+ GCPs were also apparent. Similar ectopic clusters of Purkinje cells and GCPs were also observed in the other two DW cases (data not shown). A closer analysis of lamination and cellular morphology using calbindin immunohistochemistry to mark Purkinje cells revealed extensive disruptions in all 3 DW cases. In the control cases, the Purkinje cell layer was well-defined, consisting of a distinct multilayer band of cells beneath the molecular layer, above the internal granule layer (Figure 4A–C; Figure 4—figure supplement 1A–C). In all three del chr 6p25 cases, Purkinje cells were located in a highly disorganized diffuse layer beneath the EGL. This was most marked in the posterior vermis, although in the more severe cases (DW2 and DW3), Purkinje cells were disorganized anteriorly as well (Figure 4G–I; Figure 4—figure supplement 1D–F). Higher magnification of calbindin-stained sections revealed that in all 3 DW cases, Purkinje cells also lacked their characteristic dendritic arborization, indicating at least a delay in Purkinje cell development. This was consistent with delayed fissure formation in DW2 and DW3. This may indicate a more fundamental abnormality, since Purkinje cell development was abnormal even in DW1 where global developmental delays in foliation were less apparent (Compare Figure 4—figure supplement 1A–C with D-F). Ectopic Purkinje cells were also found in the Internal Granule Layer (IGL) and cerebellar white matter (Figure 3I). Defects in Purkinje cell alignment and Bergmann glial morphology were observed in the cerebellum of fetuses with chr 6p25 mutations. (A–L) Midsagittal sections through normal (A-F) and del chr 6p25 (G–L) fetal cerebellar vermis stained for Calbindin (A–C, G–I) and GFAP (D–F, J–L). Cerebellar outlines are provided for clarity. Colored boxes show locations of panels. Ages are indicated in gestational weeks (gw). Purkinje cells during normal cerebellar development were arranged in a distinct multilayered band beneath the molecular layer throughout the cerebellum from 18–23 gw (A–C, insets). In all del chr 6p25 cases, Purkinje cells were ectopically broadly distributed in the forming cerebellar cortex (G–I). Bergmann glial fibers extended from the PC layer to the EGL in the normal cerebellum (D–F). These fibers were sparse and highly dysmorphic in the del chr 6p25 cases (J–L). Scale bar = 100 µm. As expected, all human control samples, regardless of age, had well defined GFAP+ Bergmann glial fibers extending from the EGL to the Purkinje cell layer where their bodies reside (Figure 4G–I; Figure 4—figure supplement 1G–I). While Bergmann glial fiber morphology was normal in Foxc1hith/hith mouse mutants (Figure 2—figure supplement 2M,N), their morphology, number, and location were affected in the Foxc1-/- cerebellum (Haldipur et al., 2014). Consistent with Foxc1-/- mouse data, in all three fetal del chr 6p25 cases, fewer Bergmann glial fibers were evident, with some regions devoid of Bergmann glia fibers entirely (Figure 4J–L; Figure 4—figure supplement 1J–L). Remaining Bergmann glial fibers were severely dysmorphic. This may be related to the direct requirement of SDF1α to maintain cerebellar Bergmann glial fibers (Haldipur et al., 2014). Purkinje cell deficits may also contribute to this phenotype, since radial glial maintenance also depends on normal Purkinje cell development (Dahmane and Ruiz i Altaba, 1999). The striking similarities in phenotype between Foxc1 mouse mutant cerebella and the human del chr 6p25 DWM cases validate our mouse Foxc1 mutant mouse models and suggest that many of the key mechanisms controlling cerebellar development are conserved between mouse and human. Although the diagnosis of DWM has improved with advances in brain imaging (Doherty et al., 2013), the mechanisms leading to this important human cerebellar malformation remain largely unknown. A few genes have been implicated in rare cases of DWM (Aldinger and Doherty, 2016). Of these, FOXC1 is the best studied (Aldinger et al., 2009; Haldipur et al., 2014), with mutant mouse data demonstrating several important roles for Foxc1 in early mouse cerebellar anlage development. Notably, Foxc1 expression is largely limited to the posterior fossa mesenchyme rather than the developing cerebellum itself. Complete loss of Foxc1 in mice (homozygous null animals) leads to loss of Foxc1-dependent expression of SDF1α, a secreted factor in the posterior mesenchyme. We previously showed that SDF1α acts via its receptor, Cxcr4, which is expressed in cerebellar radial glial cells and is required for both proliferation of these VZ progenitors in addition to maintenance of their radial fibers, which are the migration scaffold for cerebellar GABAergic neurons to reach the cerebellar cortex (Haldipur et al., 2014). Notably, the Foxc1-/- phenotype is much more severe than that seen in human DWM patients (del chr 6p25), who harbor a deletion of the FOXC1 gene, yet retain one intact copy on an unaffected chromosome (Aldinger et al., 2009; Delahaye et al., 2012). Foxc1+/- mice have no cerebellar phenotype, however, Foxc1hith/hith are postnatal viable and have disrupted cerebellar morphology (Aldinger et al., 2009). We have now shown that Foxc1hith/hith mutants display a unique posterior vermis foliation defect that is strikingly similar to that shared with all human del chr 6p25 DWM patients. Using lineage fate mapping in mouse models, we demonstrated that embryonic migration abnormalities of the posterior-fated cerebellar RL descendants causes this phenotype in both Foxc1hith/hith and Foxc1-/- mice and showed that Foxc1hith/hith mice also display defects in postnatal cerebellar lamination. Finally, we directly compared the developing mouse Foxc1 mutant phenotypes with very rare human del chr 6p25 fetal cases, the first reported in-depth analysis of fetal DWM samples. Strikingly, the human fetal DWM cases and our mouse models share very similar developmental pathogenesis, validating our mouse models and demonstrating that many of the key developmental mechanisms are conserved between the two species. Although cerebellar vermis dysplasia is highly variable in MRI of postnatal human del chr 6p25 DWM (Delahaye et al., 2012 and Figure 1), all three fetal cases presented here have a prominent elongation of a dysplastic posterior vermis ‘tail’. This ‘tail sign’ has recently been proposed to be a pathognomonic feature for all DWM (Bernardo et al., 2015), irrespective of those with a known genetic cause, such as del chr 6p25. Strikingly, the human DWM tail is highly reminiscent of the partially formed, unpaired posterior lobule we observed in the postnatal Foxc1hith/hith mutant mouse cerebellar vermis. This phenotype appears to be unique as we are unaware of any other mouse mutant with this foliation defect. Through lineage tracing experiments, we showed extensive ectopic migration of posterior-fated cerebellar RL descendants in both Foxc1hith/hith and Foxc1-/- mice. These ectopic paths included the mutant VZ. Cerebellar progenitor fate switches have been implicated in human cerebellar agenesis (Pascual et al., 2007; Millen et al., 2014). We therefore tested if the mutant ectopic RL derived cells in the VZ or anlage showed evidence of a RL to VZ fate switch. However, all Lmx1a-cre lineage labeled cells maintained Pax6 expression indicative of a RL lineage identity. We conclude that the Foxc1 mutant posterior vermis phenotype is mostly due to misguided migration of RL-derived cells. SDF1α expressed in the head mesenchyme is a direct transcriptional target of Foxc1 (Zarbalis et al., 2012). We have demonstrated that loss of SDF1α can rescue Foxc1-/- cerebellar phenotypes (Haldipur et al., 2014). At e12.5, when Foxc1 expression is initiated in the posterior fossa mesenchyme overlying the cerebellum, SDF1α expression is significantly downregulated in both Foxc1-/- and Foxc1hith/hith embryos at e12.5 (Aldinger et al., 2009) (Figure 2—figure supplement 1D). Since SDF1α is expressed in the mouse posterior fossa mesenchyme prior to e12.5 ([Lein et al., 2007], Website: © 2015 Allen Institute for Brain Science. Allen Mouse Brain Atlas [Internet]. Available from: http://mouse.brain-map.org. ), we conclude that Foxc1 is required to maintain, but not initiate, SDF1α. This maintenance role is key to understanding the increased vulnerability of the posterior vermis in Foxc1 mouse mutants and human del chr 6p25 DWM. Previous studies have shown that SDF1α secreted by embryonic meningeal cells embryonically acts as a chemoattractant, regulating the tangential migration of Cxcr4+ GCPs away from the RL to form the EGL (Yu et al., 2010; Haldipur et al., 2014). The cerebellar RL generates assorted glutamatergic brain stem nuclei and cerebellar nuclei in the mouse at e10.5 and anteriorly fated GCPs just before e12.5 (Machold and Fishell, 2005). By e12.5, only posterior vermis-fated GCPs and unipolar brush cells remain in the RL to emerge over the remaining days of mouse embryogenesis. Our new data clearly demonstrates that these late derivatives are absolutely dependent on continued SDF1α expression which itself is dependent on Foxc1. Our data also confirm previous studies showing a role for SDF1α as a chemoattractant in the developing pia to maintain GCPs within the proliferating outer zone of the developing EGL adjacent to the pial surface (Hartmann et al., 1998; Wiegand et al., 1998; Zou et al., 1998; Reiss et al., 2002; Zhu et al., 2002; Vilz et al., 2005; Tiveron and Cremer, 2008; Yu et al., 2010). In Foxc1 mutants, SDF1α is not maintained at appropriate levels, leading to an additional phenotype of ectopic proliferating EGL cells within the cerebellar anlage in both the anterior and posterior vermis. Our results add to the growing body of evidence that the posterior fossa mesenchyme, through SDF1α expression, preserves the structure of both the RL and the nascent EGL. By ensuring that cells correctly exit the RL and remain within the GCP niche of the EGL, the mesenchyme regulates the proper formation and lamination of cerebellar folia (Figure 5). Summary of Foxc1-dependent molecular and cellular mechanisms contributing to del chr 6p25 cerebellar phenotypes. (A) Schematic of a paramedial sagittal section of the embryonic mouse cerebellum. In the wild-type cerebellum, mesenchymal Foxc1 controls the expression of chemokine SDF1α which binds to its receptor Cxcr4 which is strongly expressed in the RL, EGL, and VZ. SDF1α functions as a chemoattractant to Lmx1a+ (red) and Lmx1a- (blue) GCPs exiting the RL to form the EGL, ensuring that these progenitors exit the RL and remain confined to the EGL underneath the pial surface. SDF1α also controls the migration of cells out of the VZ, acting as a chemoattractant. It is also required for the maintenance of radial glial fibers, which act as scaffolds for this migration. (B) In the Foxc1-/- and Foxc1hith/hith mice, deletion of Foxc1 leads to a significant downregulation of mesenchymal SDF1α by e12.5. This reduction results in excessive retention of posterior-fated cells in the RL and ectopic migration of cells out of the RL (red arrows) and precocious migration of GCPs from the EGL into the cerebellar anlage (blue arrows). Proliferation, migration, and VZ-derived neurons and radial glia are also negatively affected. To our knowledge, this report represents the first in-depth analysis of human fetal DWM. Additionally, since the cases of human del chr 6p25 we analyzed are specifically modeled by our Foxc1 mutant mice, a direct phenotypic comparison between the two species with correlated genotypes was possible. Direct comparisons between developing human fetal tissue with known genetic lesions and mouse developmental models of comparable genotypes are extremely rare in literature. All three human del chr 6p25 fetal DWM fetal cases we assessed here exhibited a striking dysplasia of the posterior vermis and also had ectopically located GCPs and Purkinje cells and dysmorphic and sparse Bergmann glial fibers. The phenotypes observed in the del chr 6p25 cerebella are similar to those observed in the Foxc1-/- mouse, providing ample evidence of the validity of our Foxc1-/- DWM models. It is necessary to state the difficulties and drawbacks of this study whilst highlighting the legitimacy and need for such analyses. First, it is clear that some of the mechanisms we have attributed to posterior vermis hypoplasia in human DWM based on our Foxc1 mouse models have not been directly validated in the human cerebellum. The human fetal DWM cases presented here are snapshots of three separate dysmorphic cerebella at specific stages of development (18–21 gw). Given the clinical constraints of human fetal tissue research and the rarity of genetically defined malformation cases, a thorough study of multiple stages of abnormal prenatal cerebellar development will be nearly impossible. We cannot define the developmental progression of these specific cases with their respective phenotypes, nor can we predict their phenotypic outcomes if the pregnancies had continued. Further, since DWM is not currently readily diagnosed by imaging until 18 gw, it is likely impossible to obtain earlier cases. However, human fetal analysis, as we have presented here, is essential because it is the only analysis that is possible. Animal models are required to investigate potential mechanisms and our current work clearly validates our Foxc1 mutant mouse models. Since our mouse models indicate that human del chr 6p25 DWM is largely due to a disruption of early mesenchymal signaling and aberrant rhombic lip development, a long term goal is to develop human fetal imaging technology and protocols targeted to these phenotypes to facilitate earlier detection and perhaps provide therapeutic intervention. In conclusion, this study presents an analysis of the changes that take place during mouse and human cerebellar development following the loss of Foxc1 and subsequent disruptions in mesenchymal signaling. We show that early disruption in mesenchymal signaling has immediate effects, including mismigration of Purkinje cells and GCPs from both the RL and EGL. There are both direct and indirect repercussions on later developmental events that lead to abnormal foliation, posterior vermis hypoplasia, developmental delays, and abnormal layering of Purkinje cells. Together our human and mouse analyses provide compelling evidence to support our model of Foxc1 control of cerebellar development and developmental pathogenesis of FOXC1-dependent DWM (Figure 5). Notably, however, human del chr 6p25 DWM cases are rare. An essential question remains as to whether the key features and mechanisms we have elucidated for Foxc1-dependent DWM are generalizable to all forms of DWM, regardless of the underlying genotype. All human studies were approved by Institutional Review Boards at all participating institutions. Written informed consent was obtained from all subjects. Criteria for diagnosing DWM included a) cerebellar vermis hypoplasia affecting the posterior vermis more severely than the anterior, b) an enlarged fourth ventricle, c) the upward rotation of the cerebellar vermis and an enlarged posterior fossa. Genetic analysis for all DWM cases has previously been published (Aldinger et al., 2009; Delahaye et al., 2012). Lmx1a-cre (Chizhikov et al., 2010) and Ai14 (B6.Cg-Gt (ROSA) 26Sortm14 (CAG-tdTomato)Hze/J; RRID:IMSR_JAX:007914 Jackson Laboratories Stock Number: 007914, N5 +F13 as of 05.05.2015) (Madisen et al., 2010) were used for fate mapping studies. All mouse tissue was processed as previously published (Haldipur et al., 2014). All human fetal samples (Figure 3—source data 1) were obtained in accordance with approved IRB protocols from SCRI. Control samples were obtained from the Department of Laboratories, Seattle Children’s Hospital, Seattle, USA and Department of Pathology, Hospital S. Giovanni di Dio, e Ruggi d'Aragona, Salerno, Italy. These were from the fetuses of elective or spontaneous terminations or intrauterine fetal deaths. Only tissues with no detectable cerebellar pathology following histopathological analyses were included as controls. The three fetal human del chr 6p25 DWM cerebellar samples were obtained from Hôpital Robert-Debré, Paris, France (Delahaye et al., 2012). The primary antibodies used in this study were Calbindin (Swant, CB38, Switzerland; 1:3000; RRID:AB_10000340), Foxp2 (Everest Biotech, EB05226 – 1:1000; RRID:AB_2107112), Ki67 (Vector – 1:300; RRID:AB_2336545), Laminin (Sigma, L9393 – 1:25; RRID:AB_477163), GFAP (DAKO, Z0034 – 1:1000; RRID: AB_10013482), Pax6 (Covance, 901301–1:200; RRID: AB_2315069), Pax2 (Zymed, 7160000–1:200; RRID:AB_2533990), Skor2 (Novus Biologicals, NBP2-14565 1:100; RRID:AB_2632379), Lmx1a (Millipore AB10533, 1:2000; RRID:AB_10805970) and Tbr2 (gifted by Robert Hevner; 1:1000; RRID:AB_2315446). We were unable to carry out double IHCs with tdTomato and Pax6/Ki67 because both primary antibodies function only following antigen retrieval which bleaches out the tdTomato fluorescence. Hence, we resorted to imaging the section with tdTomato marked cells prior to antigen retrieval and the same section was imaged following incubation with Pax6 or Ki67. For Pax6, we have presented an overlay of tdTomato and Pax6 IHC images of the same section, although they were not captured simultaneously (Figure 2O–P). To evaluate Lmx1a expression in the RL, the total number of Lmx1a positive cells in the RL was counted. This was followed by a total DAPI count that represented the total cell count in the RL. The percentage of DAPI+ cells in the RL that were also Lmx1a+ was represented in the graph. We also quantified the number of tdTomato+ cells that are found outside the RL and EGL area from e14.5-e17.5 in midsagittal sections. Statistical tests were the same as previously applied. RNA was extracted from E12.5 hindbrain of wild-type (n = 4) and Foxc1hith/hith (n = 4) littermate embryos. qRT-PCR was performed with 4–6 biological replicates as described (Aldinger et al., 2009). Seminars in Fetal and Neonatal Medicine 21:321–332. Dandy-Walker malformation: is the 'tail sign' the key sign? American Journal of Medical Genetics Part A 158A:2430–2438. Current Opinion in Neurobiology 18:237–244. European Journal of Neuroscience 22:1831–1839. International Journal for Vitamin and Nutrition Research. Internationale Zeitschrift fur Vitamin- und Ernahrungsforschung. Journal international de vitaminologie et de nutrition 68:411–416. Journal of Neuroscience Research 88:n/a–86. Thank you for submitting your article "Mouse and Human Foxc1 dependent Dandy-Walker cerebellar malformation share common mechanisms" for consideration by eLife. Your article has been reviewed by two peer reviewers, and the evaluation has been overseen by Robb Krumlauf as a Reviewing Editor and a Senior Editor. The reviewers have opted to remain anonymous. This manuscript details phenotypic overlaps in the developing cerebellum of Foxc1 mutant mice and human fetus with del chr 6p25 supporting the idea that Foxc1 mutant mice are an excellent model for Dandy-Walker malformation (DWM). The authors have identified a previously uncharacterized migration defect of granule cell progenitors in Foxc1 mutant mice suggesting that Foxc1 regulates expansion and foliation of the posterior lobe via signals originated from the posterior fossa mesenchyme in mice and humans. 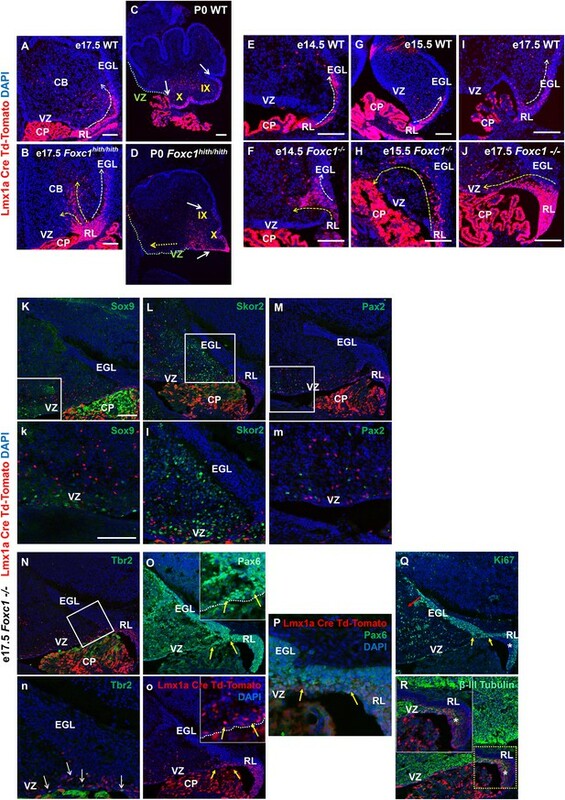 This study is novel by providing in-depth and direct comparisons between the human fetal brain and mouse models for disease DWM and is also valuable for insight on the degree of conservation in mechanisms controlling cerebellar development between humans and mice. Therefore, it is worthy of consideration for publication in eLife. However, there are a number of specific concerns shared by the reviewers primarily related problems in the depth of the characterization of mouse Foxc1 mutant cerebella that must be addressed before publication can be considered. 1) The authors show that many tdTomato-labeled descendants of the Lmx1a lineage are abnormally present in the cerebellar ventricular zone (VZ). The data provided are insufficient to determine if Foxc1 mutation causes a cell-fate change in the cerebellar VZ. It is also unclear whether the mutation affects the expression of Lmx1a or abnormal migration of the Lmx1 lineage. The authors claim that Pax6 is present in most tdTomato+ cells, and argue against abnormal cell fate specification. However, the quality of Figure 2F is too poor to support this conclusion. The authors need to provide improved Pax6/tdTomato double labeling and examine additional markers, for example, Zic1 for granule cells and Sox9 or Sox2 for VZ radial glia. In addition, short-term fate mapping or examination of Lmx1a expression should be provided to show whether Foxc1 mutation affects Lmx1a expression. 2) It is unclear how abnormal migration of the Lmx1a-lineage causes the unusual foliation defect in the Foxc1 mutant cerebellar vermis. Do the misrouted granule cell progenitors fail to proliferate? Is the VZ in the posterior cerebellar anlage compromised in the mutants? 3) In Figure 2, a conspicuous phenotype of Foxc1 mutant cerebella seems to be the increased contribution of tdTomoto+ cells to the choroid plexus (which appears larger than the control). Is this phenotype real? As the rhombic lip (also known as the germinal trillion) links to the VZ, external granule layer, and choroid plexus, the authors may examine if the rhombic lip increases contribution to the choroid plexus at the expense of the VZ and EGL in Foxc1 mutant cerebella. 4) Why are only the late RL derivatives affected? I am not entirely sure an explanation is given for this, and this is critically important because, apparently, the same population is affected in mouse and human. Is this a timing issue, or a gene expression/function issue? Either way, it appears that a highly conserved feature of cerebellum development is affected in both species. 5) This study primarily focuses on the posterior lobe (lobule X) defects and needs to be expanded to discuss other defects. The mouse Figure 1 (panel I) and human Figure 3 (panels D and E) indicates the anterior lobule is also severely affected. Based on the limited histological data on the DWM cerebella (including the previously published ones), the claim that the partially formed posterior lobe in the Foxc1 mutant cerebella echoes the posterior vermis DW "tail sign" seems to be an overstatement. The Bernardo et al. paper (2015) does not explicitly claim a link between the "tail sign" and defects specific to the posterior lobe of DW cerebellar vermis. The authors do not make a clear connection between the "tail sign" defined by MRI imaging and the histological defect specific to the posterior lobe. However, they state in the Abstract that "Particularly striking is the presence of a partially formed posterior lobe echoing the posterior vermis DW 'tail sign' observed in human imaging studies." Other defects, such as abnormal arrangement of Purkinje cells and Bergmann glial fibers and abnormal folding of the cerebellar cortex, are quite generic phenotypes. 6) Based on Figure 2D it looks to me that there may be more Cre marked cells in the mutant posterior cerebellum compared to control. Is this true? And, it also looks like equal numbers of cells adjacent to the "green" VZ line in mutant and control. Apologies if I have missed it, but is there a quantification for these data? It is hard to appreciate that there are ectopic RL derived cells near the VZ. We determined that the expression of Lmx1a in the RL at e13.5, shortly after its initiation, is unchanged in Foxc1-/-cerebellum compared to the wildtype controls (Figure 2—figure supplement 1A). This strengthens our conclusion that the phenotype we observe in the Foxc1 mutants is a result of abnormal distribution of the Lmx1a RL lineage. We replaced the panel in Figure 2E–H with better images at earlier stages to show a stream of abnormally migrating cells. The new images (Figure 2K–R) clearly indicate that none of the Lmx1a-Cre td Tomato+ cells migrating away from the RL stain for markers of VZ progenitors (Sox9) or VZ derivatives (Pax2, Skor2). The mismigrating tdTomato+ cells continue to express Pax6 indicating that they retain their RL and granule cell identity (Figure 2O–P). A subset of these Pax6 positive cells continues to divide but some begin to differentiate (Figure 2Q–R). The direct link between abnormal posterior foliation and RL abnormalities is not entirely clear, however, as we showed in Chizhikov et al., 2010, PNAS, PMID#20498066, the posterior vermis is a derivative of the late RL. The late RL is compromised in both Foxc1-/-and FoxC1hith/hithmutants. A large subset of the misrouted GCPs continues to proliferate (Figure 2Q; Figure 2—figure supplement 2C–D). However, we observe that many of the Lmx1aCre td-Tomato+ cells that fail to migrate out of the RL eventually differentiate precociously within the RL (Figure 2R). A combination of mismigration and precocious differentiation depletes the progenitors that are required to form the posterior vermis, thus leading to the formation of severely hypoplastic posterior lobules. We have now included data demonstrating that the VZ is not compromised in FoxC1hith/hith(Figure 2—figure supplement 1C). However, we have previously published that the VZ is affected in the null mutants (Haldipur et al., 2014, eLife, PMID#25513817). The phenotype described by the reviewer is indeed real. We do find a much larger choroid plexus in the mutants (Aldinger et al., 2009, Nature Genetics, PMID#19668217). We are unable to directly test this hypothesis due to the lack of RL-specific Cre mouse models or gene enhancer elements with RL expression not also accompanied by choroid plexus expression. In the Discussion, we described our hypothesis for why we think late RL derivatives are more susceptible to decreased Foxc1 expression (third paragraph). Anterior-fated lineages migrate out of the RL prior to e13.5 and are hence less susceptible to the effects of Foxc1 deletion. We have clarified this in the text. Indeed, we observe anterior defects. However, the anterior lobe is relatively normal in terms of histogenesis compared to the posterior vermis, which is far more hypoplastic and dysplastic. We chose to focus on the posterior vermis since, to our knowledge, the posterior FoxC1hith/hithfoliation is unique and unusual, and the hypoplastic posterior vermis with a partially formed unpaired posterior lobule seems to be a common link between our mouse model, the human samples presented in our study, as well as the limited number of Dandy-Walker pathology based studies (Bernardo et al., 2015, Prenat Diagn, PMID#26448595; Russo and Fallet-Bianco, 2007, J Child Neurol, PMID#17621537, Kapur et al., 2009, Birth Defects Res A Clin Mol Teratol, PMID# 19441098). The reviewer is correct in pointing out that the tail sign described by Bernardo et al. is not linked to posterior vermis hypoplasia in their study. However, based on the limited H&E images presented in Bernardo et al., it is clear that the tail sign they are referring to is the posterior lobule, which is clearly unpaired and partially formed. This is very much like what we observe in FoxC1hith/hithmutants and is readily seen in the human DW1 control presented here. Our mouse functional studies also show that this specific disruption of patterning and foliation in the posterior vermis is due to RL abnormalities. We have replaced the image in Figure 2D with a better image that is a more accurate indicator of the distribution of Cre+ cells in the mutant. We do think that there are more tdTomato+ cells along the VZ of the mutant cerebellum when compared to WT, although to better appreciate the extent of mismigration of RL derivatives in the mutant, we now quantified the number of tdTomato+ cells that are found outside the RL and EGL area from e14.5-e17.5 in midsagittal sections. The numbers in the WT are representative of the unipolar brush cell population as well as some GNs that have differentiated and migrated into the IGL. However, we do see a striking increase in the number of tdTomato+ cells outside the RL and EGL in Foxc1 mutants; many of which are ectopic in nature (Figure 2; Figure 2—figure supplement 1B). We thank Dr. Tom Kume (Northwestern University, Chicago, IL) and Samuel J Pleasure (UCSF) for providing us with the Foxc1-/- and Foxc1hith/hith mouse strains respectively. We also gratefully acknowledge the technical assistance of Joanna Yeung, Arianna Gomez, Conrad Winter, and Gwendolyn S Gillies. We thank Dr. Alexandra J Joyner (Sloan-Kettering Memorial Hospital, New York) and Dr. Raj Kapur (Seattle Children’s Hospital) for valuable discussions. The work described herein was supported by National Institutes of Health R01NS072441 and R01NS080390 to KJM. All co-authors have seen and agreed to the contents of this manuscript. None of the co-authors have any potential financial interests or conflict of interest with respect to this manuscript. Human subjects: All human studies were approved by Institutional Review Boards at all participating institutions. Written informed consent was obtained from all subjects. Animal experimentation: All animal experimentation for this study was approved by the Institutional Animal Care and Use Committee (IACUC Protocol no 14208), of Seattle Children's Research Institute, Seattle, WA, USA. © 2017, Haldipur et al. Loss of Foxc1 is associated with Dandy-Walker malformation, the most common human cerebellar malformation characterized by cerebellar hypoplasia and an enlarged posterior fossa and fourth ventricle. Although expressed in the mouse posterior fossa mesenchyme, loss of Foxc1 non-autonomously induces a rapid and devastating decrease in embryonic cerebellar ventricular zone radial glial proliferation and concurrent increase in cerebellar neuronal differentiation. Subsequent migration of cerebellar neurons is disrupted, associated with disordered radial glial morphology. In vitro, SDF1α, a direct Foxc1 target also expressed in the head mesenchyme, acts as a cerebellar radial glial mitogen and a chemoattractant for nascent Purkinje cells. Its receptor, Cxcr4, is expressed in cerebellar radial glial cells and conditional Cxcr4 ablation with Nes-Cre mimics the Foxc1−/− cerebellar phenotype. SDF1α also rescues the Foxc1−/− phenotype. Our data emphasizes that the head mesenchyme exerts a considerable influence on early embryonic brain development and its disruption contributes to neurodevelopmental disorders in humans.